The City of Tempe, Arizona will soon be home to the Valley’s first streetcar system, moving people and making destinations more accessible. This 3.7-mile track circulates around the Arizona State University campus, through bustling downtown Tempe, and along the rapidly growing business district on Rio Salado. This streetcar project is a critical element to expanding Valley Metro Rail to riders going to work and class, shops, restaurants, and special events in the downtown Tempe area. Our biggest challenge — designing the system to operate safely, reliably, and comfortably on streets shared with congested vehicular and pedestrian traffic. 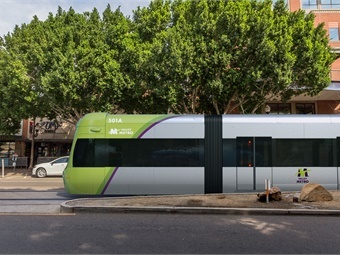 Using hybrid technology, the streetcar will run on battery throughout the downtown area, eliminating the need for overhead wires and preserving the city’s tree-lined charm. Since it runs through one of the most densely developed and highly valued urban areas in the Valley, stakeholder engagement is a critical piece of the project to ensure community voices are heard and respected. Our experts coordinated with stakeholders throughout the design process to minimize impacts to new developments, local businesses, students, and families in the area. Tempe will be far more accessible and vibrant with the introduction of this new mode and its overall commitment to public transportation. Once completed, riders will not only enjoy the art-enriched downtown area of Tempe, but they will have direct connectivity to downtown Phoenix, Mesa, and points beyond through the ever-expanding Valley Metro Rail system. Tom Wolf is a program manager with Stantec.